Elements Of Nutrition, Your Answer To The New Year! It’s all too familiar; it’s a new year and you pledge to lose a few pounds; to join a gym and start a new exercise routine, vowing to count every last calorie. But soon, you’re eating snacks at the office, a few pieces of candy, a cupcake here and there, grabbing happy hour mojitos, thinking, just once it won’t hurt. A healthy lifestyle starts here, at Elements of Nutrition, with a Registered Dietitian on site, you are bound to find anything you are looking for. 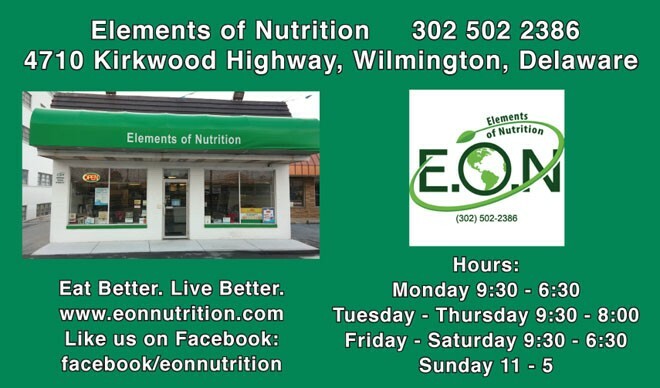 Located on Kirkwood Highway, E.O.N brings you some of the newest yet most effective supplements, body care products, Non-GMO verified products, and healthy lifestyle choices! Elements of Nutrition has a lot of product options for Gluten free lifestyles. Caren, a Registered Dietitian, holds a degree in Nutrition and Dietetics from the University of Delaware. She has influenced the lives of many individuals with her passion for food, healthy living, along with her nurturing and caring style. Caren consults people about nutrition, their diet, food choices, and other acute conditions. Elements of Nutrition, a new independently owned and operated natural and organic health food store, centrally located, and brings a fresh well-being to the community. Along with a large selection of bulk- including grains, nuts, herbs, spices, and coffee, and fresh local organic produce, Elements of Nutrition offers many other selections, including shelf stable, refrigerated and frozen foods to make it easy to prepare whatever you want. Don’t have what you’re looking for? Ask an employee about ordering special products especially for your needs! Maintaining a healthy lifestyle has many benefits including lowering your risk for heart disease. Begin the New Year by making better choices, for example, add vegetables to the foods you love—like eating pizza topped with spinach, broccoli, and green peppers instead of sausage and pepperoni. Swap the all-or-nothing approach for one or two healthy switch-ups in your daily routine. For instance, eat breakfast of about 300 calories –a healthy mix of protein and whole grains; additionally, budget for the treats you love, by eating healthy snacks like carrots and hummus, so you can occasionally splurge on decadent treats like dark chocolate. In the New Year, try to be mindful of your choices, and portion sizes while looking forward to going to the gym, by loading an iPod with feel good jams. This will put you in an upbeat mood, and push you, which translates to an energizing positive mood, which just might keep you there wanting to hear your entire playlist. “Great local store with fresh organic produce! 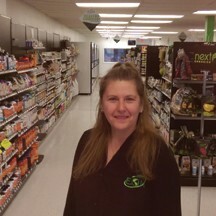 The owner is knowledgeable about her products and knows exactly what I’m interested in. It’s more than just a shopping, it’s an experience.” – Tony S.
“Elements of Nutrition has the best prices for organic, vegetables and health foods when compared to their competitors. If they do not have a particular item that you are looking for, the manager will do what she can to get it in the store.The staff is very accommodating and as a bonus, they do not have a corrupt board of stewards.” – Kelly O. Next Story → Make This The Year That You Invest In Yourself!